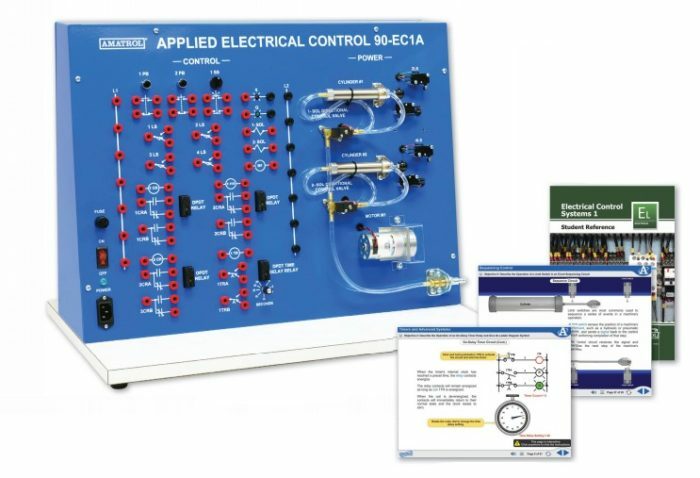 The Electrical Control 1 Learning System (96-ECS1) teaches learners how to interpret, design, and operate relay control circuits using ladder diagrams. Electrical control is vital in the operation of electric and fluid power actuators and also forms the fundamental building block of automation systems like programmable logic controllers (PLCs), which are programmed using the electrical control schematic method, the ladder diagram. Electrical Control includes a tabletop console with pre-mounted electrical control, pneumatic, and electric power components. Each component’s electrical terminals are connected to heavy-duty banana jacks, enabling learners to quickly connect and operate a variety of automation control circuits. This learning system also features interactive multimedia curriculum covering major topic areas like control logic, ladder diagrams, sequencing control, timers, and advanced systems. This multimedia curriculum comes alive with exciting animations, videos, and interactive exercises. Electrical Control features numerous real-world components including DPDT relays, double-acting cylinders, limit switches, pushbuttons, accelerator switches, and solenoid operator valves. Learners use these components mounted on a tabletop, 18 gauge steel workstation to practice hands-on skills such as connecting and operating logic control circuits to energize fluid-power actuators and an electric motor. A timer relay and limit switches are used to provide sequencing control. Electrical Control features interactive multimedia curriculum with a stunning breadth and depth of topics. Major topic areas include logic elements, ladder diagrams, electro-pneumatic solenoid valves, relay operation and applications, limit switch operation and applications, time-delay relays and applications, multiple cylinder control, and machine modes of operation. This curriculum is presented in an interactive multimedia format with video, animations, and audio. The Electric Relay Control Virtual Trainer (NB703) replicates the hands-on components in such great detail that learners will feel like they are using the actual equipment. This virtual trainer allows learners to become familiar with common components and practice their newly acquired skills either as a stand-alone virtual solution when space is limited or while waiting for others to finish practicing on the real-world Amatrol trainer. The teaching capability of the 96-ECS1 can be greatly extended with the addition of the Computer Control Option (96-CT1). Computer Control uses an industrial programmable controller with a console that mounts directly to the top of the Electrical Control console. All inputs and outputs on Electrical Control can be interfaced to Computer Control to enable learners to program the PLC to run real-world automation components.